Popular opinion generally holds that white tea is low in caffeine. Some people even refer to white tea as decaffeinated or caffeine free, but this is incorrect. White tea naturally contains caffeine and is not decaf unless it explicitly says it is on the package. There are many factors that influence the level of caffeine in tea, but you can reduce caffeine in your white teas with these techniques. White tea is not that much lower in caffeine than other types of tea. The amount of caffeine in white tea varies by type and a cup of it can contain anywhere from 6 to 75 milligrams of caffeine. Try brewing whole-leaf white tea instead of using teabags. Teabags often have more caffeine than loose-leaf tea. The original study showing that white tea is naturally high in antioxidants and low in caffeine came from white tea's homeland (Fujian, China), where white teas made from several local tea varietals were tested. In the years following this study, white tea production spread to India, Indonesia, and elsewhere. Now most of the "white tea" on the market is not traditional white tea at all, but rather a tea processed like white tea, yet made from different types of tea plants. These teas are commonly produced with the Camellia sinensis assamica tea plant, which is naturally higher in caffeine than the Camellia sinensis sinensis plants grown in Fujian. White teas from Fujian are more likely to be made from the types of plants that were used for the original test and to be lower in caffeine. 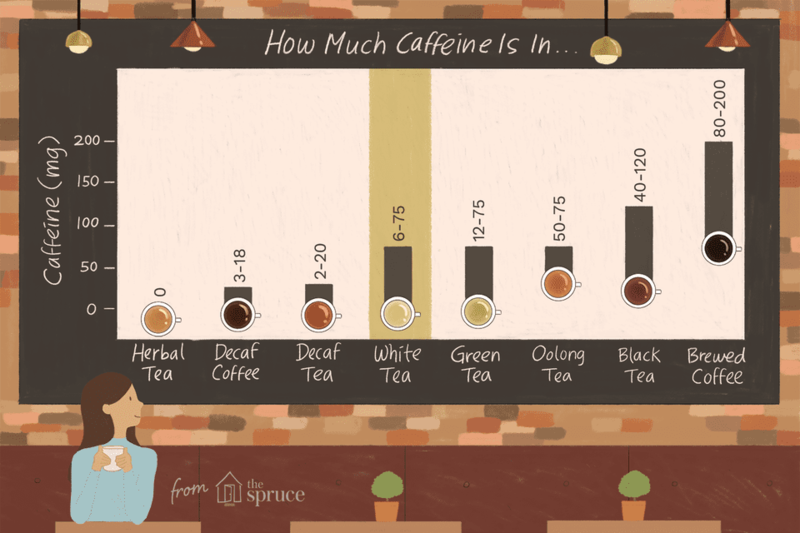 Decaf white teas are not 100% caffeine-free, but they are lower in caffeine than other green teas. Just don't fall for the home decaf myth. Despite rumors to the contrary, there is no scientifically proven way to decaffeinate tea at home! Tea buds or "tips" are typically higher in caffeine than older, more mature leaves. For that reason, spring harvest teas (like Bai Hao Yinzhen/Silver Needles White Tea) are often (but not always) higher in caffeine than late-harvest teas (like White Peony Tea). A blended white tea, such as a 50-50 blend of pink rose petals and white tea or peppermint and white tea, typically contains about half the caffeine of its unblended counterpart. Similarly, Stash Tea's Fusion Red & White Tea (a blend of rooibos "red tea") contains only 19.2 mg of caffeine per 8-ounce serving. White tea's surge in popularity has led to numerous bottled, bagged and blended "white teas" on the market that are actually made with more green tea than white tea. Check your labels! If green tea (or black tea or oolong tea, for that matter) is in the blend, skip it. Many people use fully boiling water to brew white tea or brew white tea for more than five minutes. This increases the level of caffeine in your cup. Instead, use water that's 190 degrees Fahrenheit or lower and brew for up to four or five minutes at most. Instead of using fresh leaves for multiple cups of tea, re-brew the same leaves several times. The caffeine levels are drastically reduced after the first infusion, so you get a much lower caffeine intake from preparing white tea this way.